New Hope is the inspired product of some forward thinking by a group of visionary church leaders in 1994. They thought there might be a different way to do church--a way that would be more casual and appealing to young families--a way that was just as committed to seeking Jesus Christ and carrying out a mission of discipleship but that would make church more fun and more of a "whole family" affair. Today that vision has blossomed into New Hope Presbyterian Church (PCUSA). 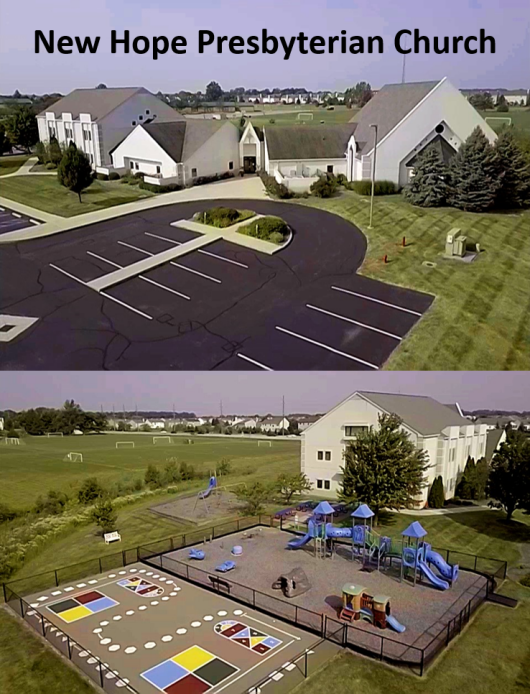 What began as a small worship service in a funeral home, soon moved to Conner Prairie, then to Hamilton Southeastern High School, and finally to our present building, which was opened on Christmas Eve of 1997, and expanded in 2001. Today, we have more than 650 members from all different backgrounds, faith experiences, ages, economic conditions, and in transient Fishers--we come from geographies all over the country, and indeed, the world. Rooted in the geographic center of the sprawling town of Fishers, we're equidistant from both Fishers and Hamilton Southeastern High Schools, blessing us with a buoyant youth group of committed young Christians who care for one another and stand out as examples at their schools and in our community. Our pre-school draws children from newborn through pre-kindergarten. Nothing adds energy and life to a church more than the excited, smiling faces of a gaggle of young children who are growing up with one another, interacting with adults who know them, love them, and want to help them know Jesus Christ. Despite the relative youth of our congregation, we're blessed by the wisdom of many older adults who have "been there done that." And not only do they have the "t-shirt," they have the stories to tell, lessons to share, and love to lavish on us. They have a commitment to serve--and the leadership to keep us focused. They are honored, involved, and we treasure them. And staff? There may not be a more faithful bunch who know God and share enthusiasm for Him with biblical grounding and realistic measure. Biblical preaching is the central element in our worship experience, and it's delivered in a tone that's inspiring and hopeful. Our children's programming is thematic, organized, and delivered with love. Our youth leadership is energetic and focused, our worship and music experience is meaningful and relevant, our prayer life vibrant, and our fellowship, rich. And what about the future? At New Hope, we are committed to following the lead of Jesus Christ--taking the message of grace and salvation to our community and beyond. We're also passionate about one another. We know one another. Our lives are intertwined, so we laugh with each other, celebrate with each other, grow with each other, and mourn with each other. We are family. This is our safe place. This is where we know what we'll find when we walk in the door--no matter what shape we're in when we do so. And we believe that the "family" we've become to one another can be a model for our community at large. We're constantly asking ourselves: Would we be missed in Fishers if we weren't here? We will if we're relevant--we won't if you don't know us. So get to know us. Give us a test-drive. See if you don't find New Hope to be a place that is welcoming, inspiring, hopeful, meaningful, and a place you'd like to make a home away from home.